No doubt about it; Microsoft co-founder, philanthropist and uber-billionaire Bill Gates has done a lot of amazing things in his years on this planet. Through the Bill and Melinda Gates Foundation, he’s given away $28 billion (almost half of his total wealth) since 2007. That money has gone to improving education, providing medical aid for millions of children, upgrading water/sanitation in the developing world and much more. Along the way, Gates has persuaded other billionaires, such as Warren Buffett, to similarly dedicate massive amounts of their personal wealth to charity. In short, this guy ROCKS. So what about the graphic (found in an Internet atheism community) that inspired me to write this essay? I did some research; after reading several interviews, it seems Gates can best be described as agnostic. That means he declares that he simply doesn’t know if there’s a God. 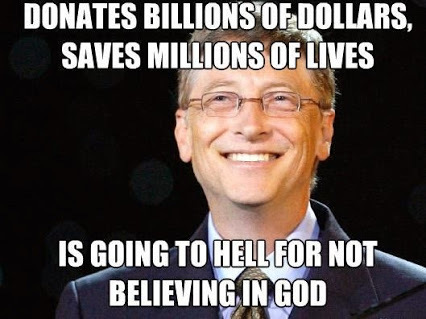 So, is Bill Gates going to hell, as this graphic suggests? The simple answer for me is: I don’t know. As a follower of Jesus Christ (whom serious Christians believe is God’s Son), I DO know that giving $28 billion or $280 billion to charity is not the ticket to Heaven. No one can buy eternal life with God. It’s not for sale. On the other hand, having faith in Jesus and doing nothing about it isn’t going to go over well, either. I don’t know where that leaves someone like Bill Gates. After all, despite his “God-acts” he is not (and never will be) anywhere close to perfect. For example, under his direction the United States government took Microsoft to court over anti-competitive business practices. Despite Gates’ testimony, the company lost. In addition, while Gates was chairman and chief software architect, Microsoft lost another major anti-competition court case, this time to the European Union. Meanwhile, Gates still has more than half his massive fortune and will almost certainly finish his life a very, very wealthy man. But never mind Bill. What about YOU? You can’t buy your way into Heaven, so how does your behaviour stack up? Examine it with cold, hard realism. Can you defend and account for every wrong thing you’ve done and every right thing you’ve failed to do? If you’re like me, you can’t. But by believing in Jesus Christ and following Him, you don’t have to. He’s the gift that gives you eternal life. How about giving Him serious consideration?